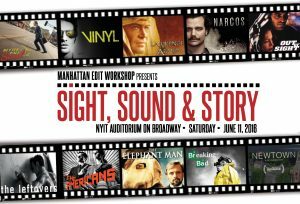 We're excited to be part of this year's Sight, Sound & Story one day post-production workshop presented by Manhattan Edit Workshop! Ross Shain, our CMO, will be moderating the Visual Effects: Behind the Green Screen and the Integral Role of the VFX Team panel from 10-11:30am. Exclusive Giveaway from Boris FX & Imagineer! All attendees receive a free 3 month subscription to either Boris Continuum Complete 10 for Avid or Adobe or mocha Pro 5 planar tracking & masking utility.